What happens when a society built on violent, dictatorial power faces collapse? How do we deal with violent youths whom we cannot control? How much freedom should we give those who we allow to shape our children from boys to men? Vincent Grashaw’s SXSW drama “Coldwater” tries to deal with these challenging questions in the form of a narrative about a juvenile boot camp, the kind of place that thinks violence and Army training techniques are the way to deal with teens whose parents no longer have the answers. It’s a promising topic for a drama, and Grashaw’s talented leading man carries it until the filmmaker steals it from him and destroys everything built up in the first hour. The final act of “Coldwater” is horrendously misguided, the kind of insincere melodrama that erases the memory of what came before. It’s a particular shame because there’s an hour of decent filmmaking here. The title refers to a remote location at which parents essentially give up the protective rights to their children and allow alpha males to form them into “better citizens.” These places exist, and, as the end credits inform us, do so with little governmental oversight, leading to injuries and even death. When your son has reached a point where bad behavior becomes violent and illegal, what do you do to keep him out of jail? It’s a serious question facing hundreds of families. Grashaw clearly believes that places like Coldwater are not the answer. From the minute that Brad (P.J. Boudousqué) gets there, Coldwater is painted as a testosterone-heavy corner of Hell. The teens are forced to run miles every day, given little water along the way, and that’s the highlight for many of them. Sprayed with fire hoses, strung up by their wrists and left overnight, etc.—Colonel Frank (James C. Burns) seems to honestly believe that his reform structure will turn boys to men but it’s a harrowing process to do so. And, perhaps worst of all, Frank has a system in which the “good kids” become Trustys and eventually employees of Coldwater, which naturally encourages in-fighting among the barracks. When a friend of Brad’s named Jonas (the naturally talented Octavius J. Johnson) gets hit by a counselor-driven ATV on a run, Coldwater starts to fall apart. The incident brings in some authority figures and Colonel Frank begins to sense that his days may be numbered. What happens when a mad man starts to lose his control? You can imagine that it gets worse before it gets better. And when one of Brad’s old buddies (Chris Petrovski) comes to Coldwater, it’s the match hitting a lake of gasoline. The majority of what works about “Coldwater” for its first hour can be laid at the feet of Boudousqué, who looks like a young Ryan Gosling and has a bit of that actor’s remarkable internal gravity. The actor is allowed to essentially play multiple iterations of Brad, as we see flashbacks to what got the young man to Coldwater in the first place, watch the struggle of his early days, and end with a character who seems broken to the degree that one could argue the Colonel’s strategy worked. He’s a shell of a man by the middle of the film, but he’s more of a man than a rebellious teen. There’s a daring film there—the idea that these facilities are breaking troubled teens down to the point that they may be more “mature” but they’ve lost their identities in the process. “Coldwater” is one of those films that we know can’t possibly end well, and yet the final act feels unearned and manipulative. The subtlety of the performances in the first two acts are discarded for explosions of violence and surprisingly tidy resolutions. Grashaw offers a climax in the traditional sense of the word in that the film almost becomes an action movie, and strains credulity by taking that route. 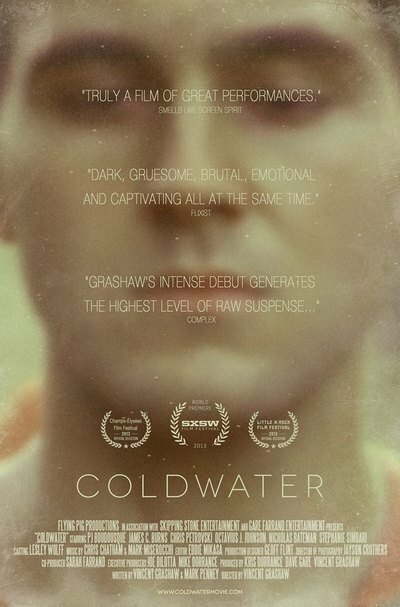 Instead of the character drama, “Coldwater” becomes something designed to provoke and thrill in the final act when it should be finding the sad truth of troubled youths and people who abuse the positions of power granted them. It’s as if Grashaw couldn’t stomach the thought that these kind of nightmarish situations often don’t have the closure that filmmaking can provide. And, even though it makes for a disappointing film, who can really blame him?